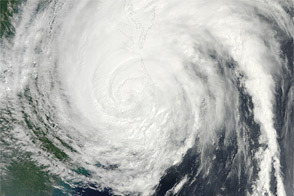 Hurricane Irene is a large and dangerous storm. In this image, taken by the Moderate Resolution Imaging Spectroradiometer (MODIS) on the Terra satellite on August 25, bands of thunderstorms spiral tightly around a dense center, forming the circular shape of a well-developed hurricane. 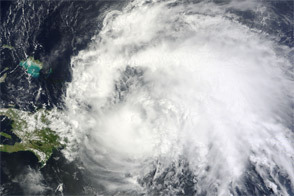 At the time the image was taken, 11:50 a.m. Eastern Daylight Time, Irene was moving over the Bahamas with sustained winds of 185 kilometers per hour (115 miles per hour). Irene has a long reach. The storm is large, spanning nearly 1,000 kilometers (600 miles) from east to west in this image. Though the storm is moving north-northwest at a mere 20 km/hr (13 mph), it will be within reach of U.S. shores within 48 hours, warns the National Hurricane Center. 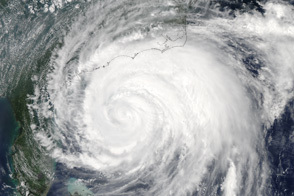 At the time the image was taken, a tropical storm watch extended from north of Edisto Beach, South Carolina to Surf City, North Carolina, and a hurricane watch covered the area from Surf City to the Virginia border. This means that tropical storm or hurricane conditions are possible in the next two days. See the National Hurricane Center for current watches and warnings. 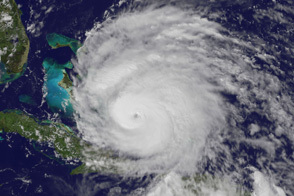 Irene was a Category 3 storm when this image was taken, and it could intensify slightly in the next day or two. The storm’s currently forecasted track takes it over the Outer Banks and along the U.S. East Coast before going ashore over New England. Even as cities throughout the densely populated East Coast prepare for the storm, residents of the Caribbean are beginning to assess the damage caused by the passing storm. Initial damage estimates are at $3.1 billion, said the Associated Press. Floods and mudslides forced 38,000 people from their homes in the Dominican Republic, which received a glancing blow from the storm. 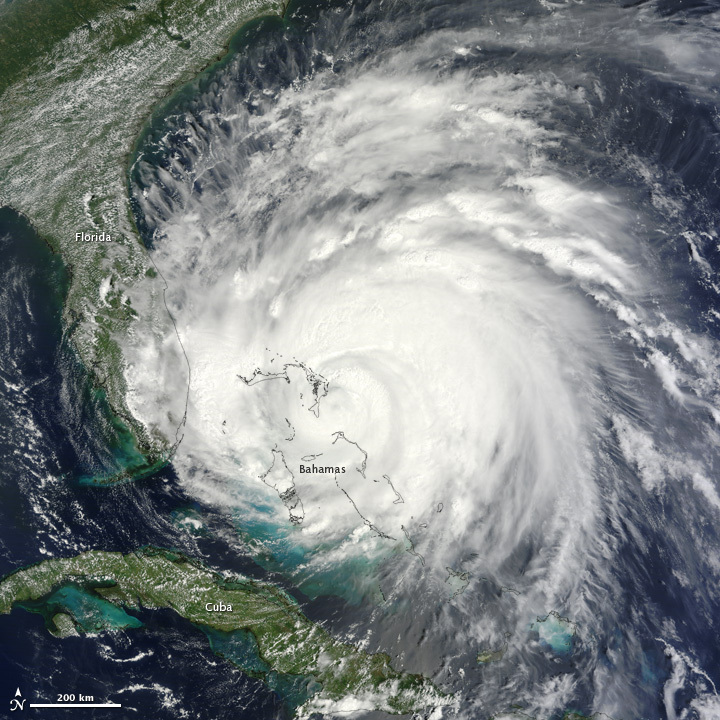 Large and dangerous, Hurricane Irene spans nearly 1,000 kilometers (600 miles) in this photo-like satellite image from August 25. 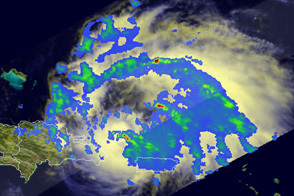 Irene formed as a tropical storm east of the Leeward Islands on August 20, 2011. 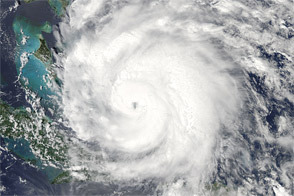 By August 24, the storm had strengthened to a Category 3 hurricane. Graham, S. and Riebeek, H. (2006, November 1). 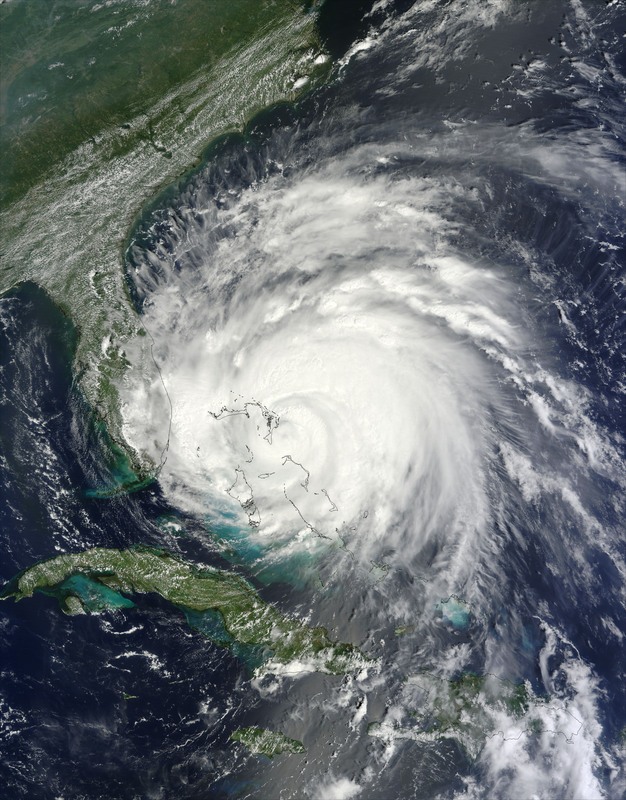 Hurricanes: The greatest storms on Earth. Earth Observatory. Accessed August 25, 2011. Guzman, R. (2011, August 25). 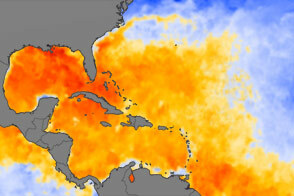 Hurricane Irene barrels toward US as Caribbean islands take stock of damage. Associated Press published by the Christian Science Monitor. Accessed August 25, 2011. National Hurricane Center. (2011, August 25, 1500 UTC/11 a.m. EDT). 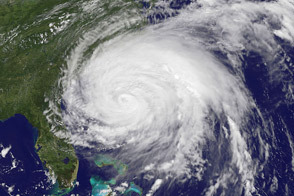 Hurricane Irene. Accessed August 25, 2011.